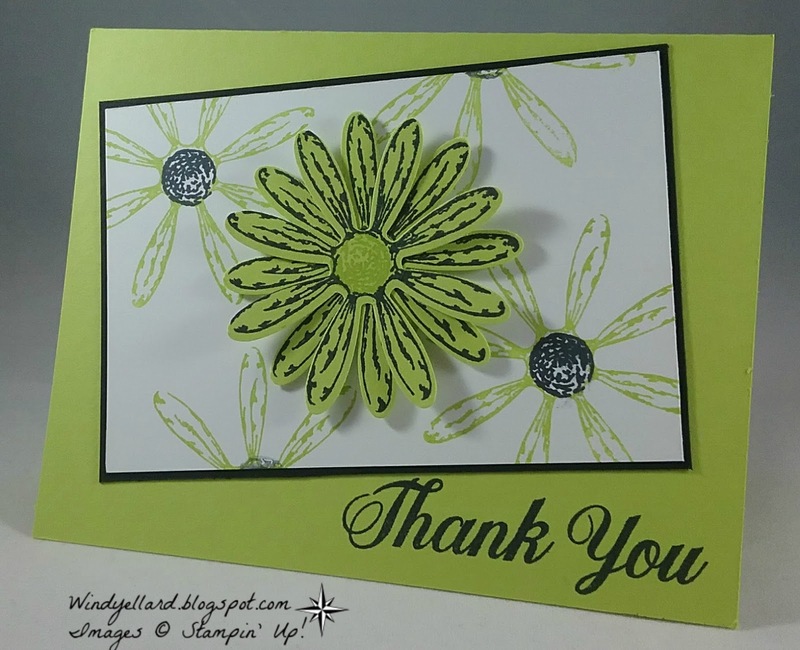 I like the Lemon Lime Twist and Basic Black color combo. with this color combo and the this set. on Whisper White and black for the center. 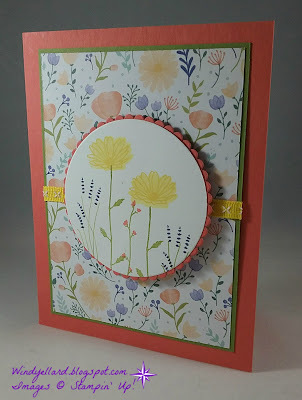 I cased another card for the new annual catalog on page 129. That one is in Powder Pink but using the same set. 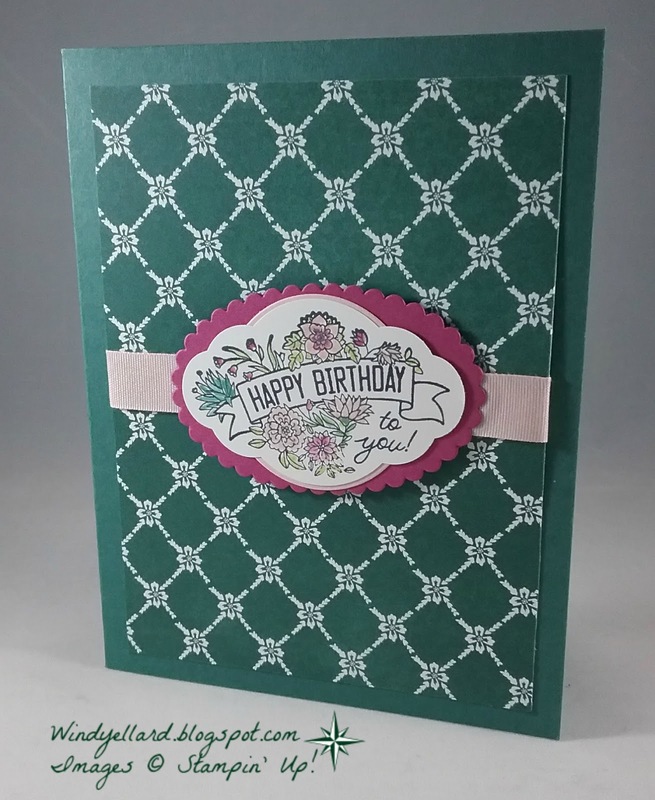 card stock embossed with Sparkle emboss folder. All Things Thanks in Fresh Fig-what else? Finished it off with a few rhinestone. I hope you have refreshing day! note card with some Wood Textures DSP. I added some 1/4" cooper trim ribbon around with a simple knot. I stamped the sentiment in Old Olive and placed on a banner of Whisper White. 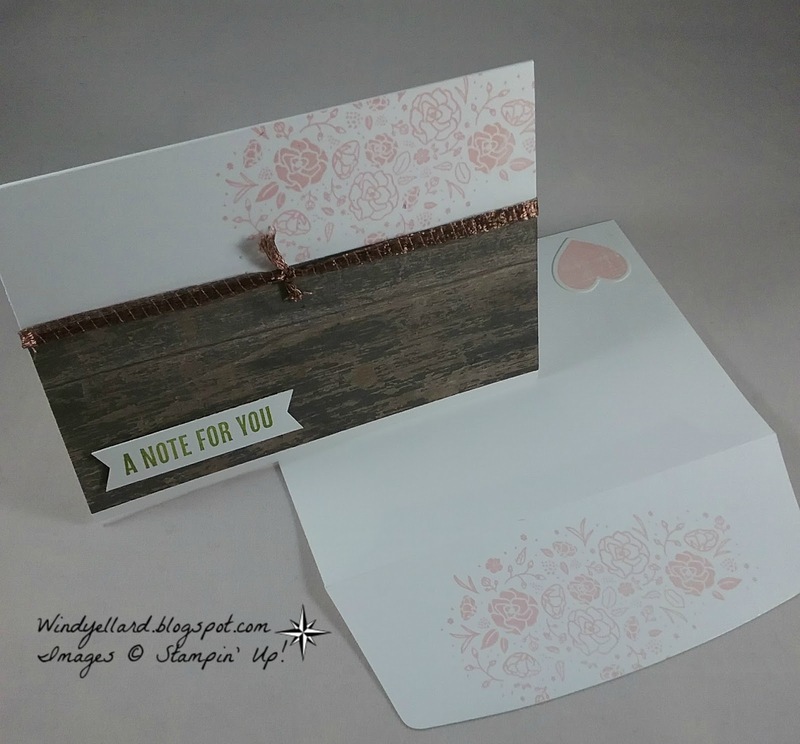 The flowers are stamped in Powder Pink. I stamped some in Powder Pink on the envelope, too! I hope you have lovely day and thanks for stopping by! this At Home With You bundle. and welcome mat on Crumb Cake in Soft Suede ink. 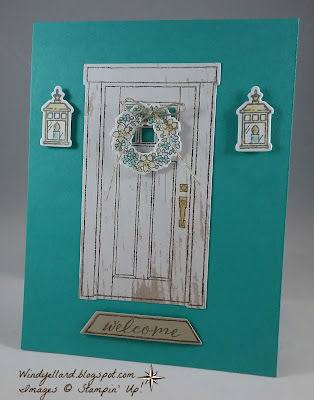 I stamped the lanterns and the wreath on Whisper White in Basic Gray. 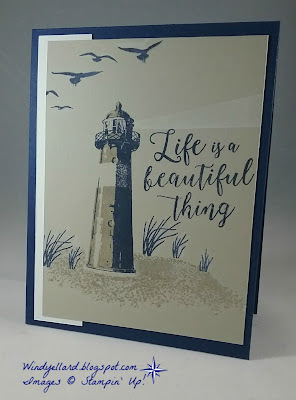 I then cut them all with matching dies called At Home framelits dies. to color. I like how they pop on the Bermuda Bay base. other elements I will try later. so played with them again! 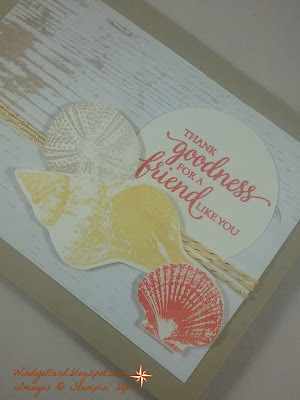 This time I stamped on a circle and layered it with a scallop one in Coral. I will add one to the inside when I go to use it. magazine for demos I wanted to case. I used Sahara Sand card stock for my background. and then Night of Navy. I then went over the grass and birds with navy. It does not show up on my photo here but gives a shadow effect. on grabbing from this set! I hope this peaceful scene helps you have a lovely day! and so I used two different prints here in Berry Burst. 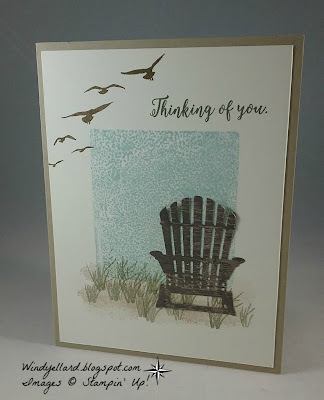 I cannot seem to stop grabbing the sentiments from this set! 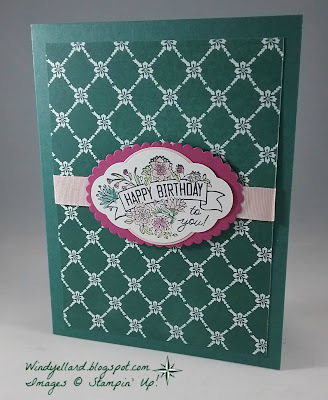 I finished this card with some black twine. So simple bit the DSP looks so rich! to make a fun and colorful background. 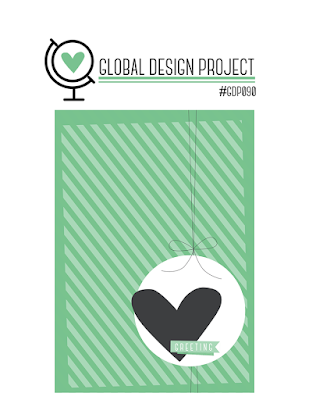 ready to place on your project. 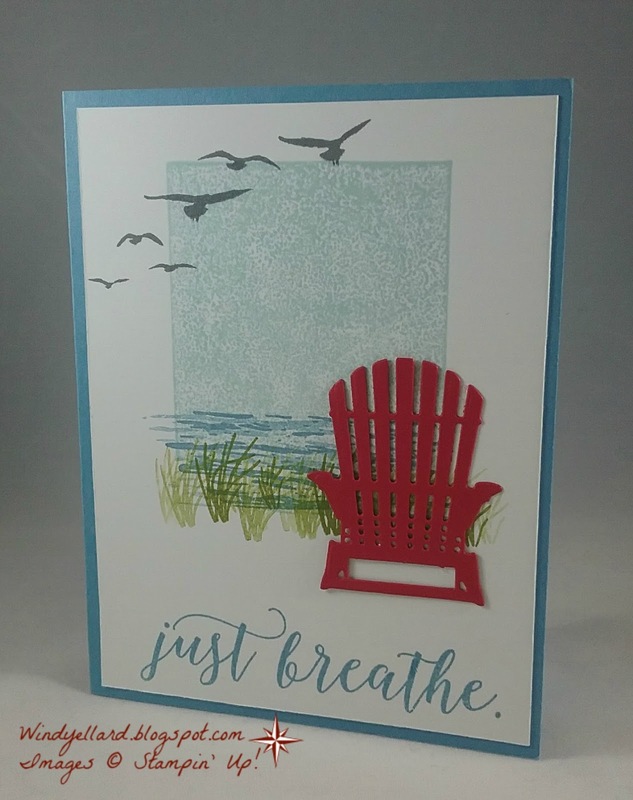 Tranquil Tide layered on a Tranquil Tide card stock base. 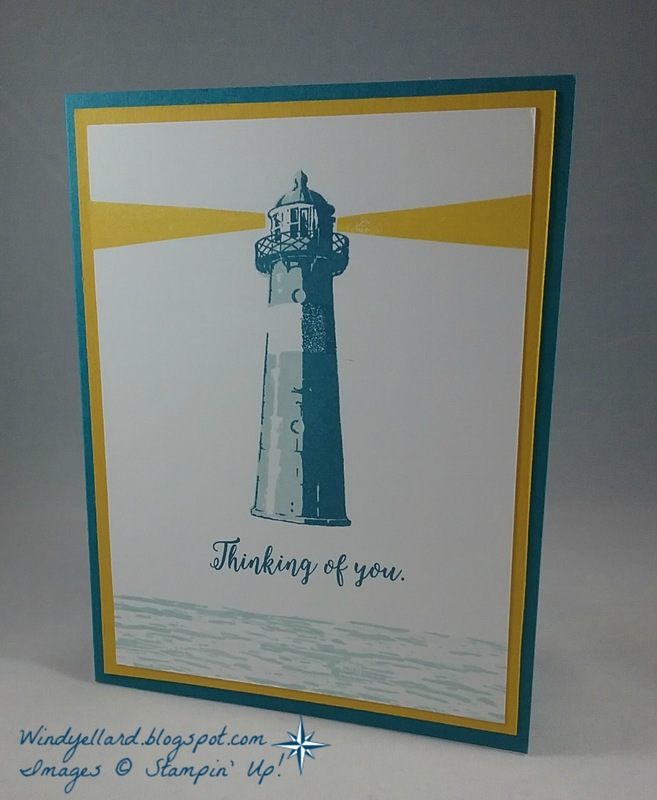 Berry Burst, Lemon Lime Twist and Tranquil Tide. I punched it out with the matching Pretty Label punch. 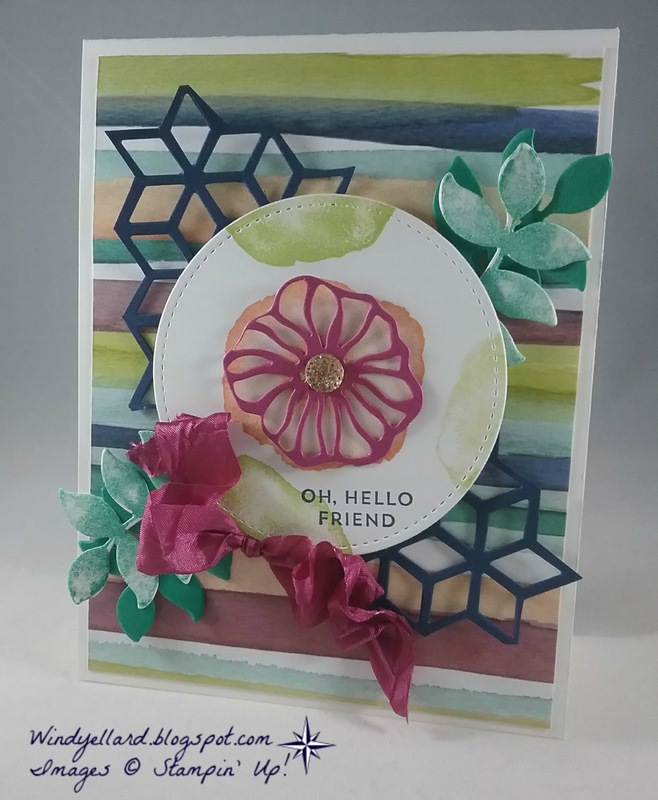 I layered on a piece of Berry Burst cut from the Layering Ovals framelits dies. I finished it off with some Powder Pink ribbon! from the cover of the new 2017-2018 catalog. I looks busy but I love all the details. awesome DSP called Naturally Eclectic after I cut it in half. 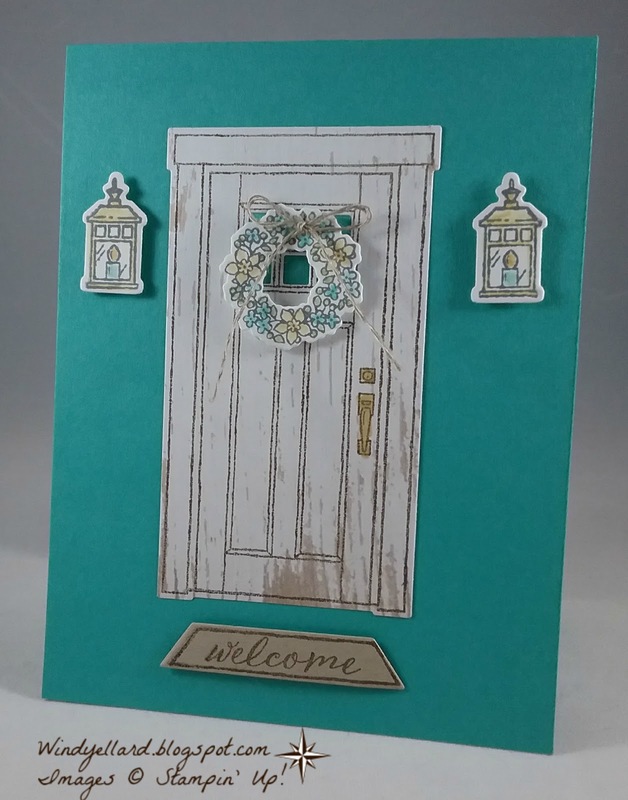 from the same set called Oh So Eclectic. and then cut two out from the card stock. to layer over the top. and the Berry Burst 5/8" crinkled seam binding. 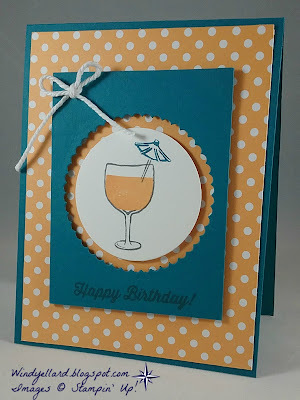 Love this card and all the colors! this past weekend to play with my new sets. They came while I was gone on vacation. I really love this Fabulous Flamingo set! Memento Tuxedo Black for the outline. 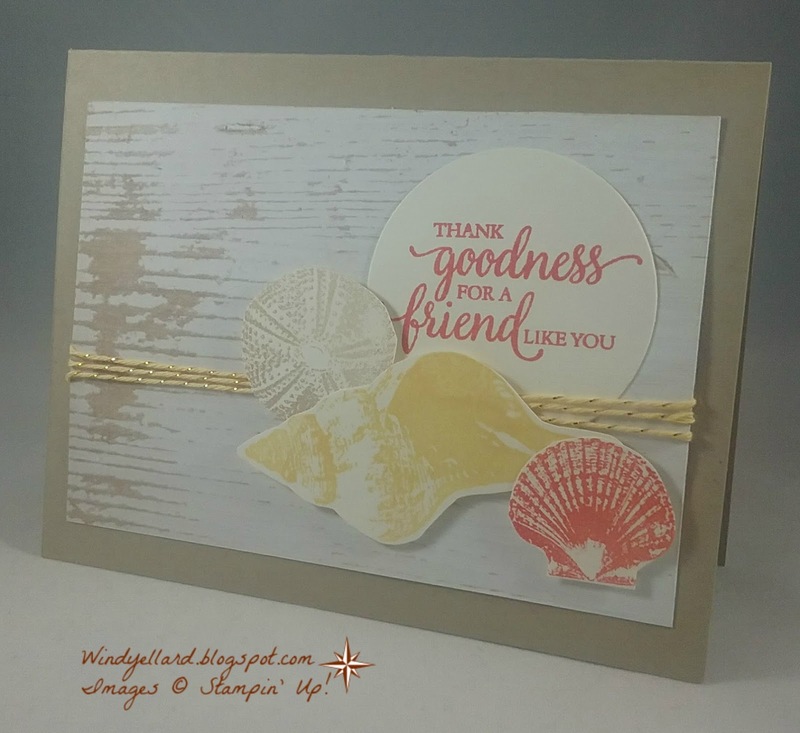 I love the Pinewood Planks emboss folder. Works really well with this set! had to place a Flirty Flamingo bow. 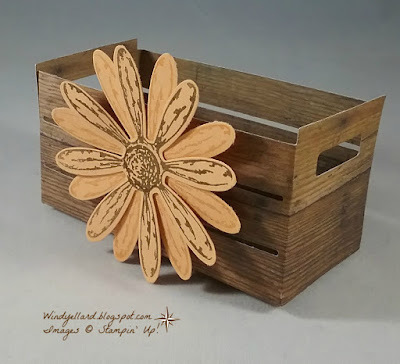 I started with some Wood Textures DSP for the background. 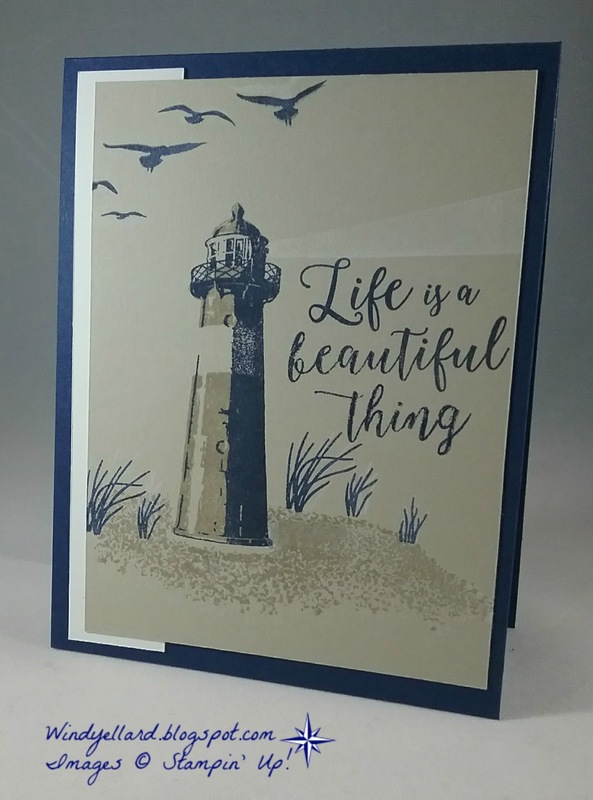 This is my fav print from this paper stack. then I poorly hand snipped them. I really wish I was good at cut things out. 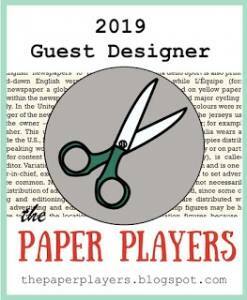 Never have been good at cutting esp. a straight line. which So Many Shells is full of these. way it turned out for my first shell card. 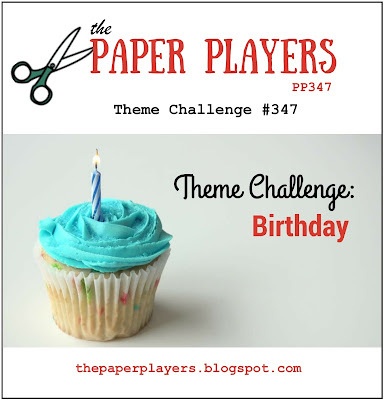 Hope you can play along with the challenge soon. Head over to tictactoechallenge.com to see more. 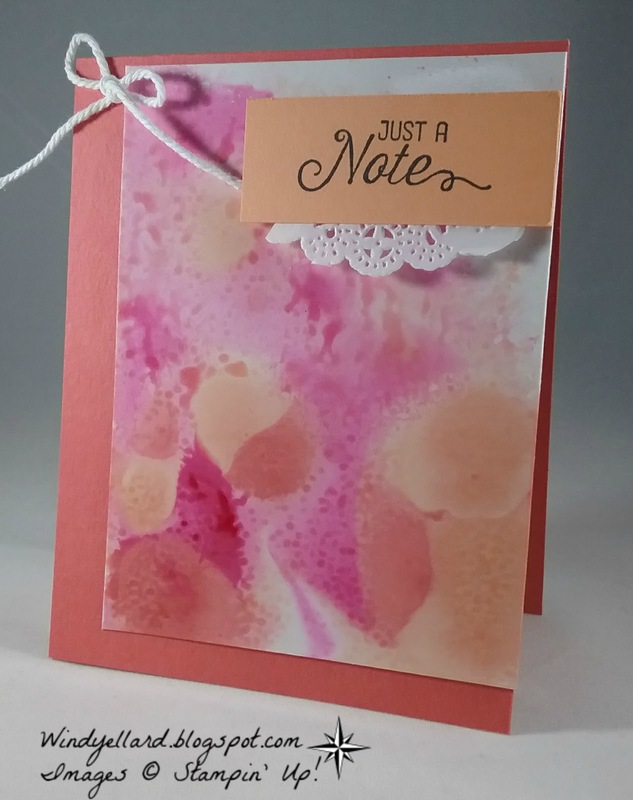 Another card with glossy white card stock and ink and water! 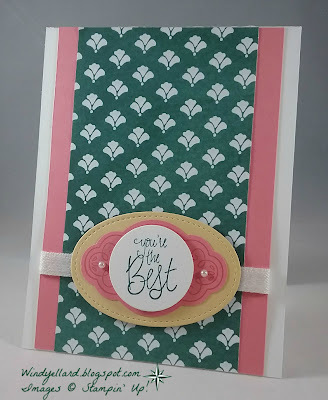 I did a little more casing from my Stampin' Success magazine for demos. Dapper Denim, Marina Mist and Pool Party. I then spritzer a bit of water in my hand a dripped it on the paper. I let it dry for this water effect. I stamped the sentiment from Colorful Seasons in Early Espresso. in Whisper White and Marina Mist. I will for sure do this technique again! 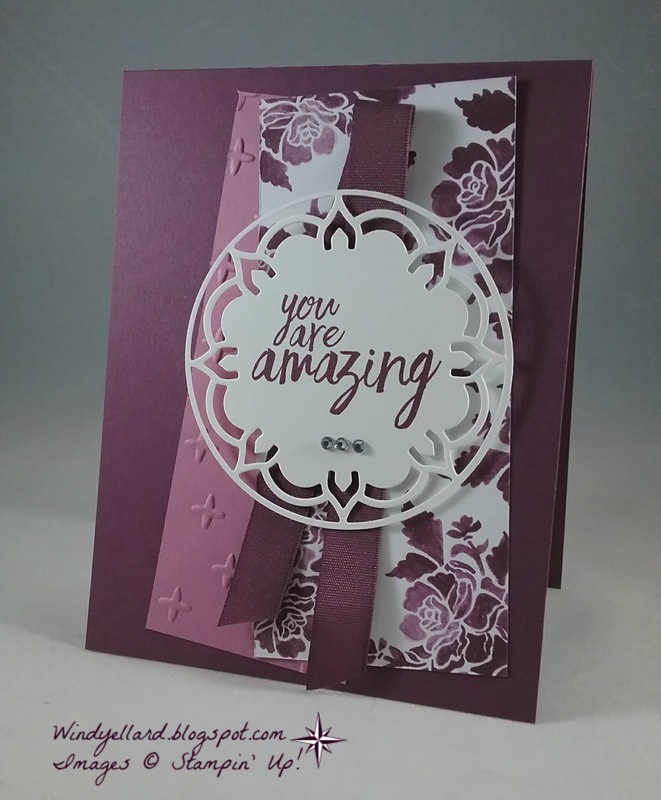 magazine us demos receive from Stampin' Up! 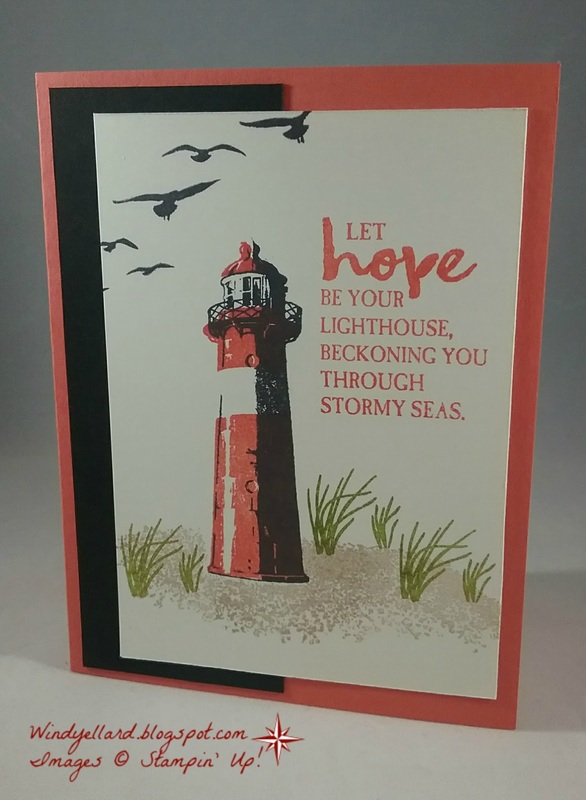 It has loads of samples and tips and business info. and ink refills and water! 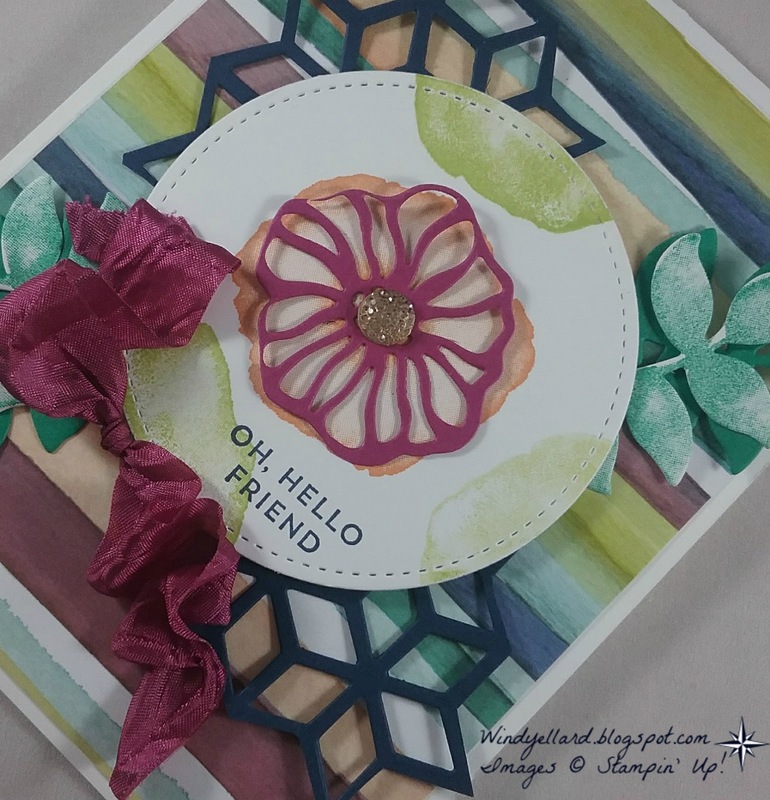 Calypso Coral, and Peekaboo Peach on the paper. I then spray it lots with water in a stampin' spritzer. I let the ink run and the blotted it with a tissue. I let it dry which was really quick. stamped in Memento Tuxedo Black on Peekaboo Peach. I hope you can try this technique soon! 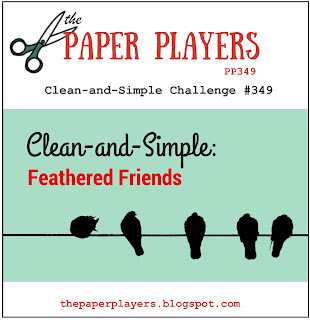 Stop back tomorrow for another one using the glossy paper. Hope your day is colorful and thanks for stopping by! case this catalog from page 126. Delight Daffodil 1/4" double-stitched ribbon. I added some sweet Delightful Daisy DSP. I finished it off with a gold clip. 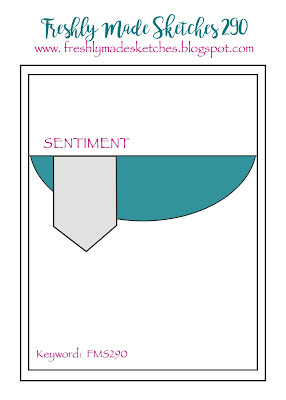 I need some cards in my stash that have no sentiment. with the Label Me Pretty stamps and punch over. 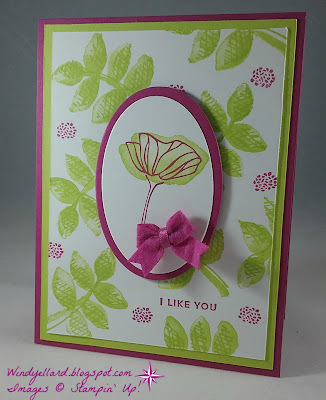 and a scallop one in Powder Pink behind so gives a little texture. I also grabbed three glitter enamel dots for the bottom to finish it off! 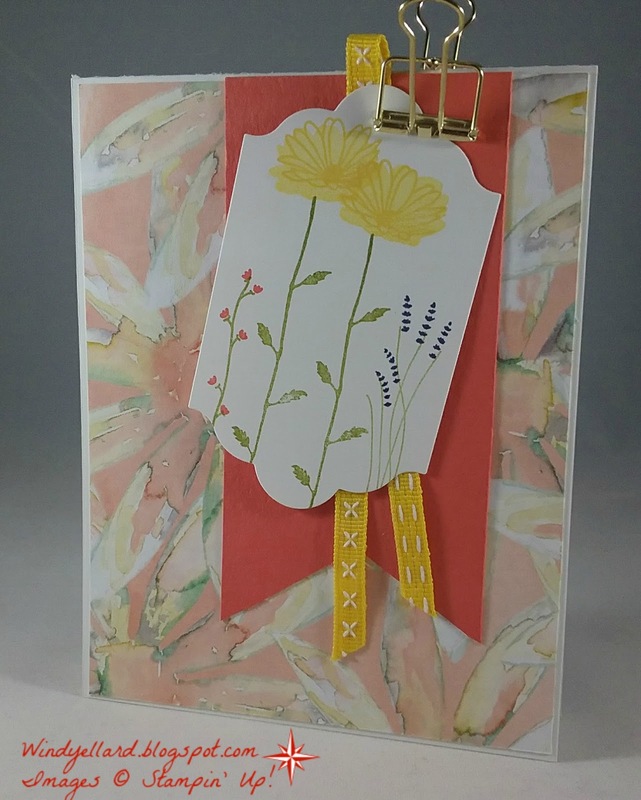 when I was designing for my card class. I decided I did not like it for that card and re stamped my jar. 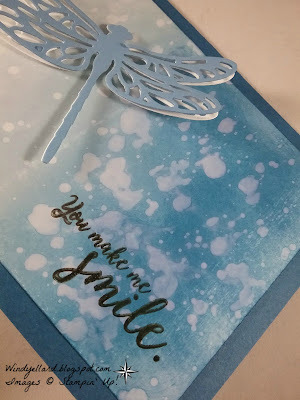 I decided to use this and make a card for my stash. when I grabbed a base, I grabbed the new Berry Burst to use. Looks pretty much in sync so we will go with it! 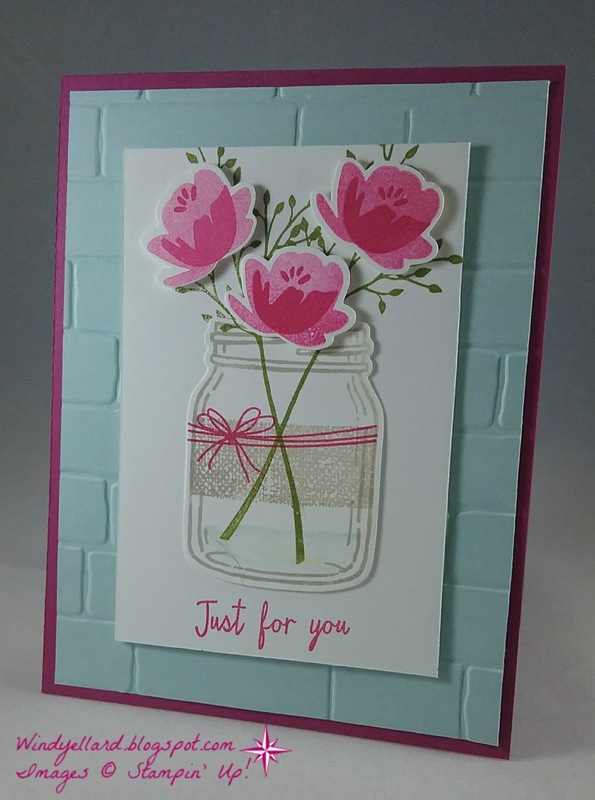 of the jar with Soft Sky ink. 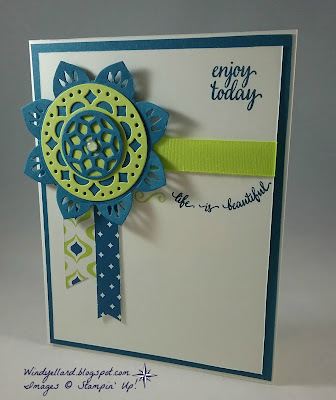 I was playing around with my Oh So Eclectic set. 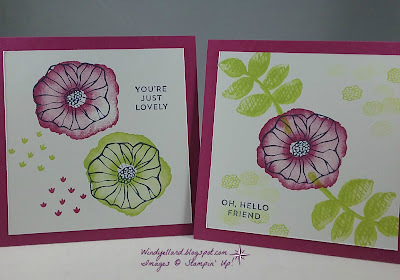 but you can do lots of stamping with this set. packages I am sending out of retired set/products. 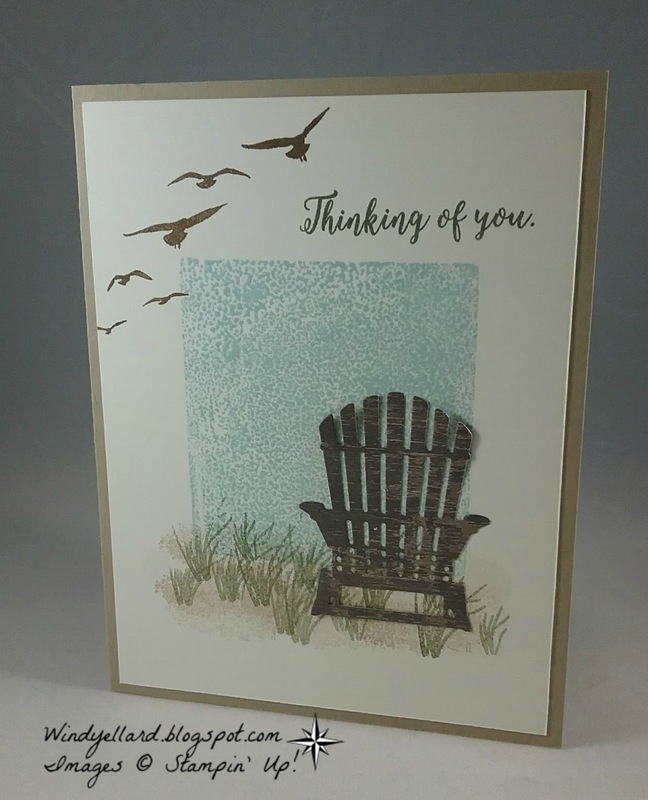 Thinking Of You Wooden Chair! Playing again with the clear block and ink! which is layered on a piece of Crumb Cake for the base. I cut the chair in Wood Textures DSP for a cool wooden chair! The grass is stamped in Always Artichoke as well as the sentiment. Some Crumb Cake for sand with Soft Suede birds in the sky! 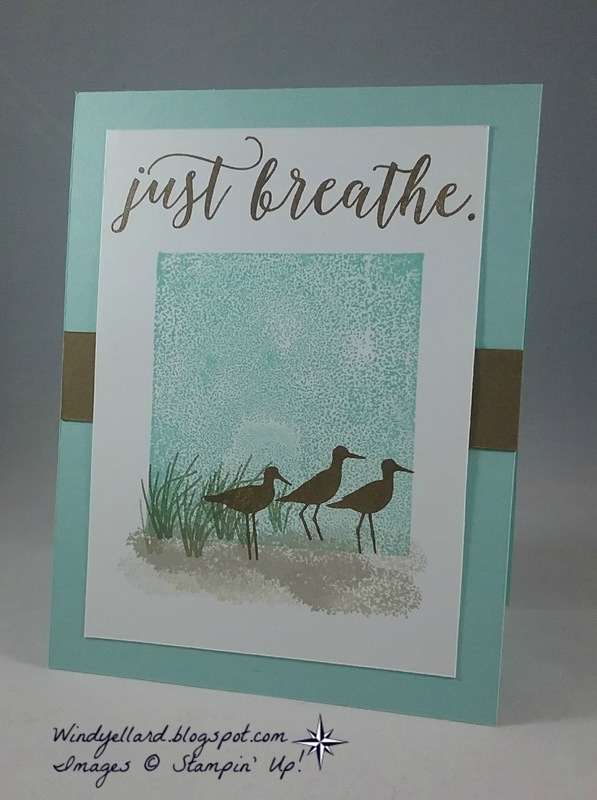 the peacefulness of the sea! Happy Birthday In Navy and Daffodil! 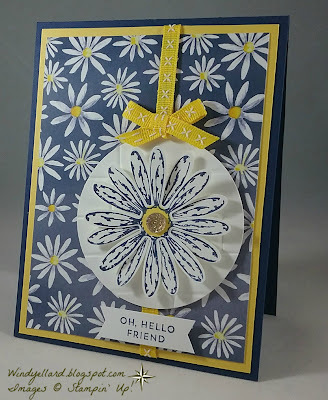 I do love blue and yellow together! with the Label Me Pretty set and matching punch. 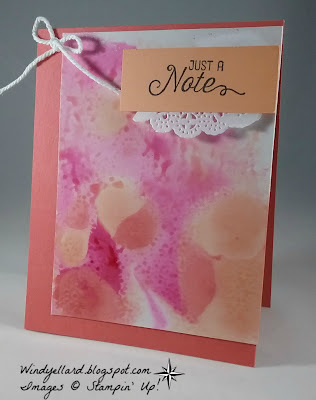 I stamped the label in Night of Navy and punched it out. 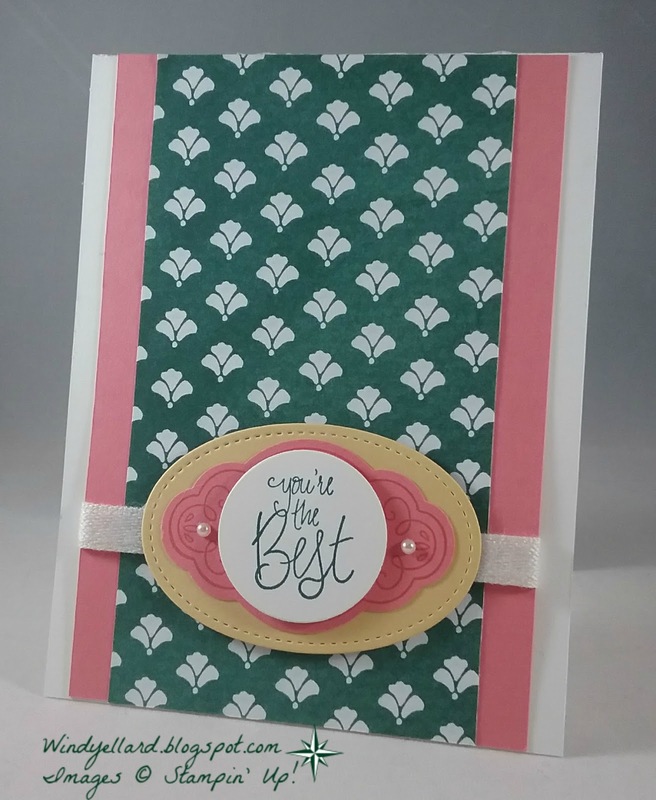 added another scallop oval from the Layering Oval framelits dies. Finished it off with some navy twine. 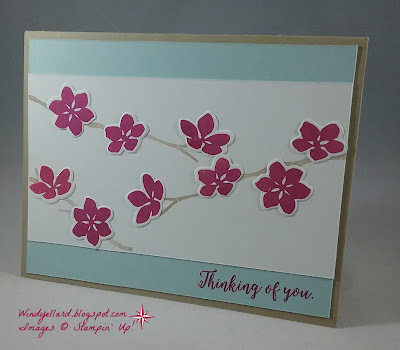 I wanted to do something simple with the branches and flowers! in Berry Burst. 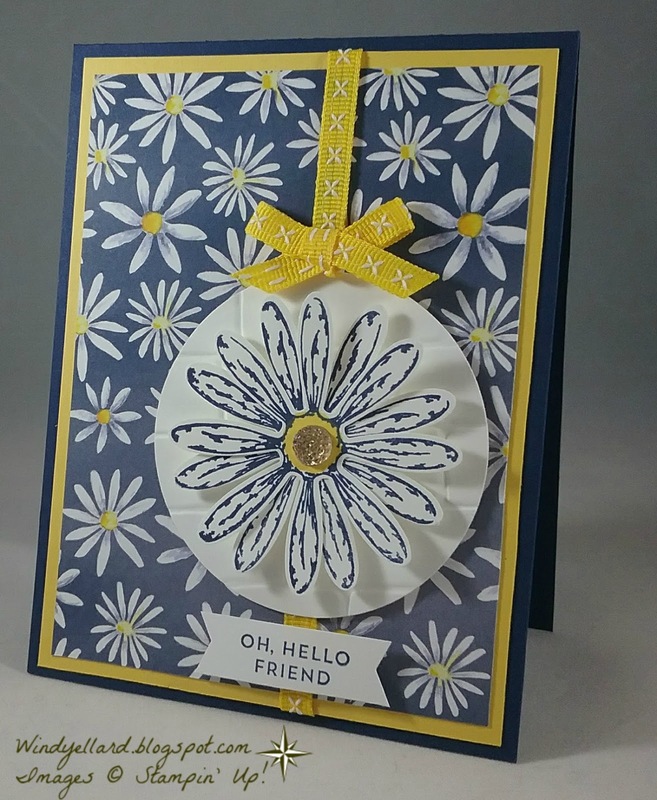 I cut the flowers with the matching dies and popped them on. 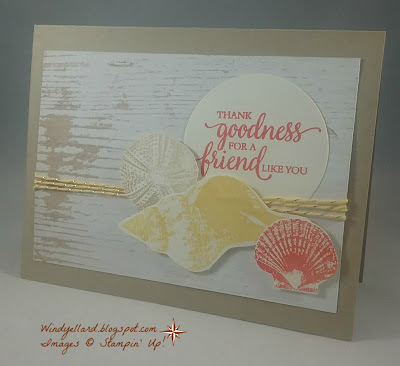 I added a sentiment from the same set called Colorful Seasons. I hope you have a sweet day and thank for stopping by! Tranquil Tide, Flirty Flamingo, and So Saffron. So I wanted to try it. 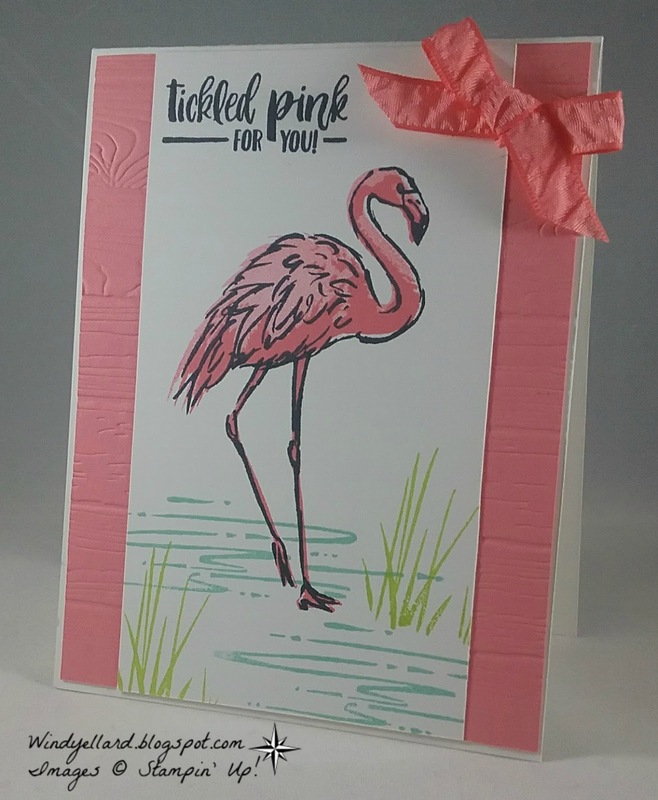 then added some Flirty Flamingo paper on thick Whisper White card stock base. 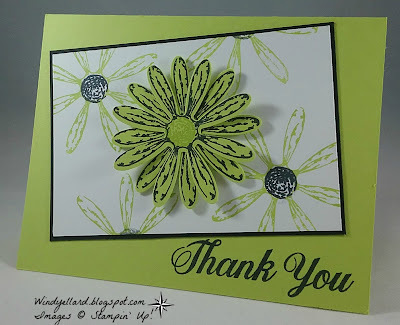 Thanks for thanks for stopping by! 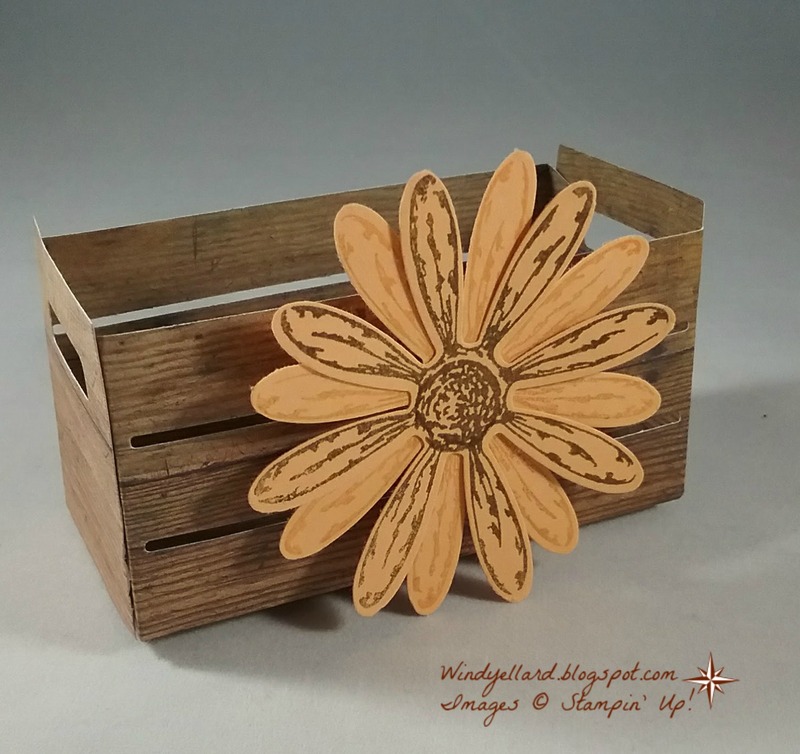 Just playing around with the wooden crate! I really think it it is stinkin' cute!
. 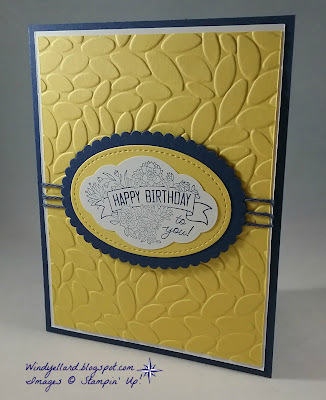 I layered it with Daffodil Delight and Night of Navy card stock. 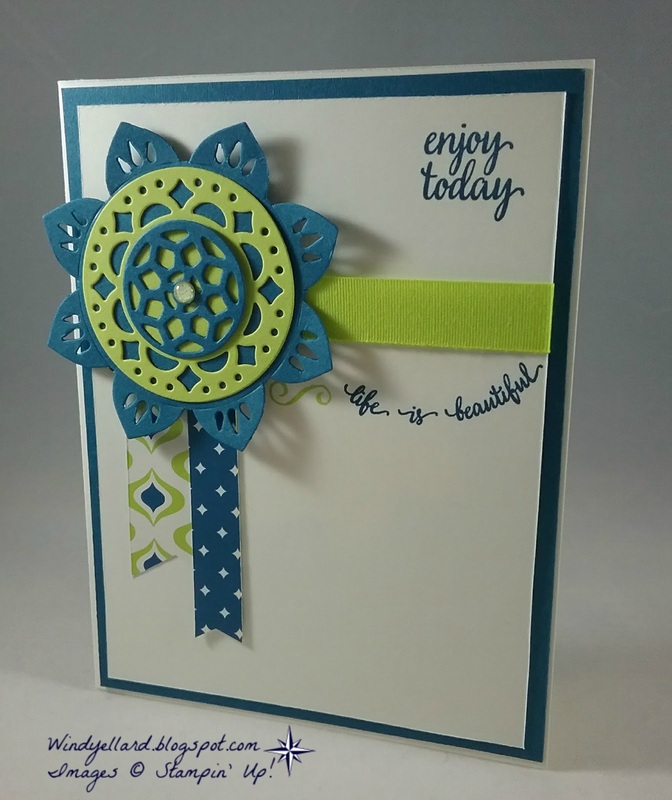 I stamped the daisy on white with Night of Navy plus Daffodil Delight in the center. 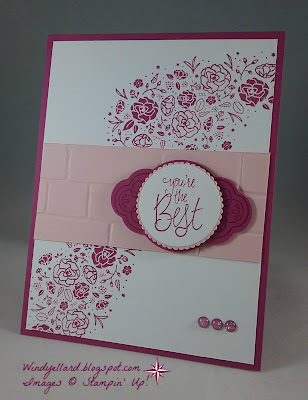 I embossed with the Brick Wall emboss folder. a gold gem to finish it off. challenge I thought I would challenge myself by not using them! I pulled out the under used Mixed Drinks set and went for it! with Basic Gray on the stem and Island Indigo on the umbrella. and then cut from a scrap of card the Island Indigo scallop circle. behind and on top of more Island Indigo for the base. 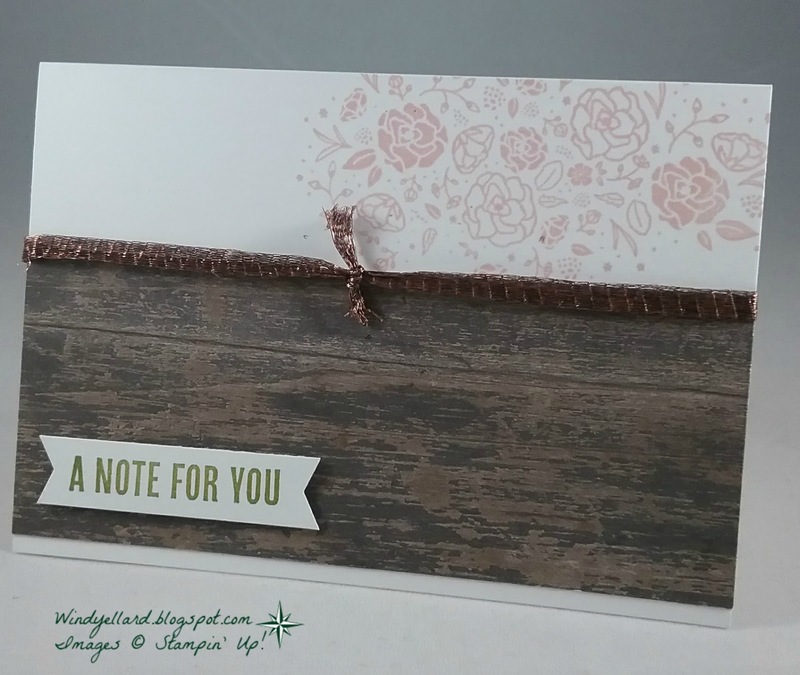 I finished it off with a thick white twine bow! The sentiment was grabbed from Birthday Banners set! Again creating a background by stamping with a clear block. I used Pool Party ink this time with the block. 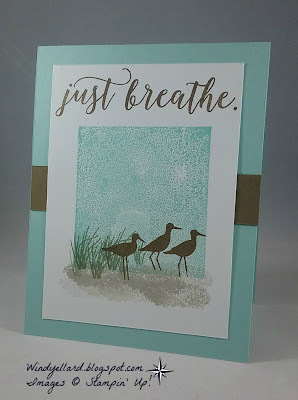 stamped the birds and sentiment in Soft Suede. I only added a strip of Soft Suede to the base so the scene is the focus. listening to the waves of the ocean. a lovely relaxing week, too! 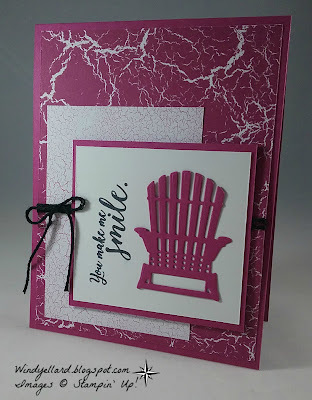 plus the chair die from Seasonal Layers. 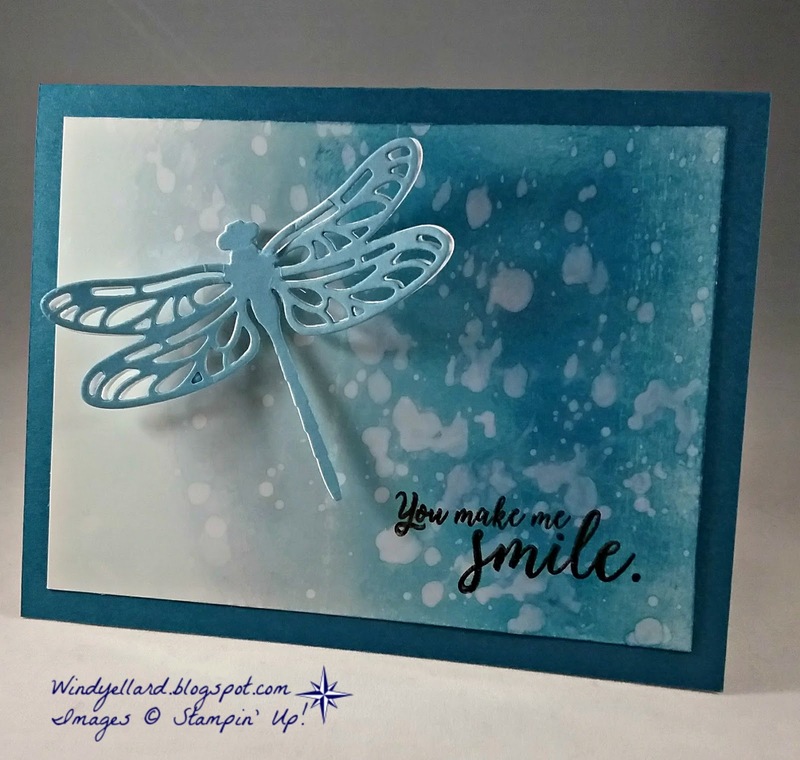 I stamped the background with a size D clear block in Soft Sky. I added water with with Marina Mist ink and grass with Old Olive in. from Real Red to pop with the blues. when I saw the sketch and decided to make them work. ribbon across and used the Eastern Palace DSP for banners. I love the curve of the sentiment Life Is Beautiful. 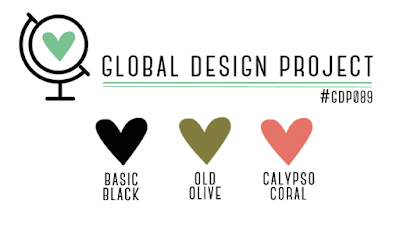 it would be a good challenge with these colors. and did some grass in Old Olive and some Crumb Cake for sand. I did a simple sketch so you focus on the scene and sentiment. and the light shining from it to make the sketch. I like the way it turned out with the blues and the Crushed Curry. 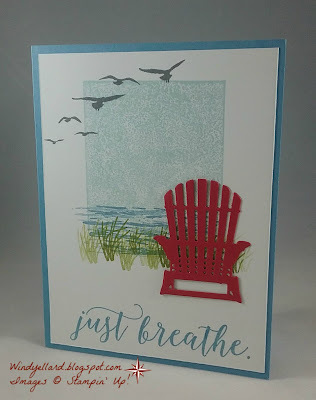 sentiment from Colorful Seasons with Indigo ink. I hope you have a bright day and thanks for stopping by!